There has been widespread discussion around the ‘disruption of the banking industry’. A sector typically slower than others to respond to digital innovation, with the introduction of new compliance and regulation policies, is under increasing pressure to future-proof their operations, and mobile is increasingly at the center of this. Not only is smartphone ownership now almost universal (with regional variations), mobiles continue to strengthen their position as the most important device for getting online. As such, opportunities in the banking sector have shifted. This has paved the way for smaller, nimbler players like digital-only challenger banks promising an exclusively mobile experience that cater for every need. So, what are the implications of mobile banking, and what’s in it for traditional retail banks? The end of 2016 saw online banking’s transition into a mobile-first activity. Indeed, the convenience and time-saving advantages of banking via mobile – allowing users to pay bills, transfer money and monitor their financial affairs while on-the-go have proven extremely valuable. 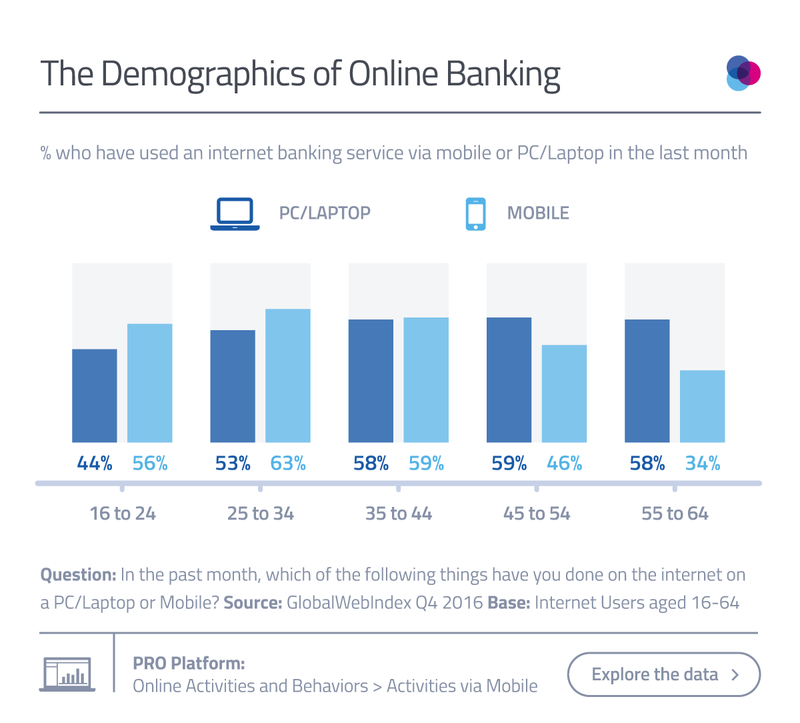 But according to our data, the overall percentage figure for online banking via any device remains relatively steady (on around 3 in 4 internet users). So crucially, what’s changing most is how these online bankers are managing their money online. 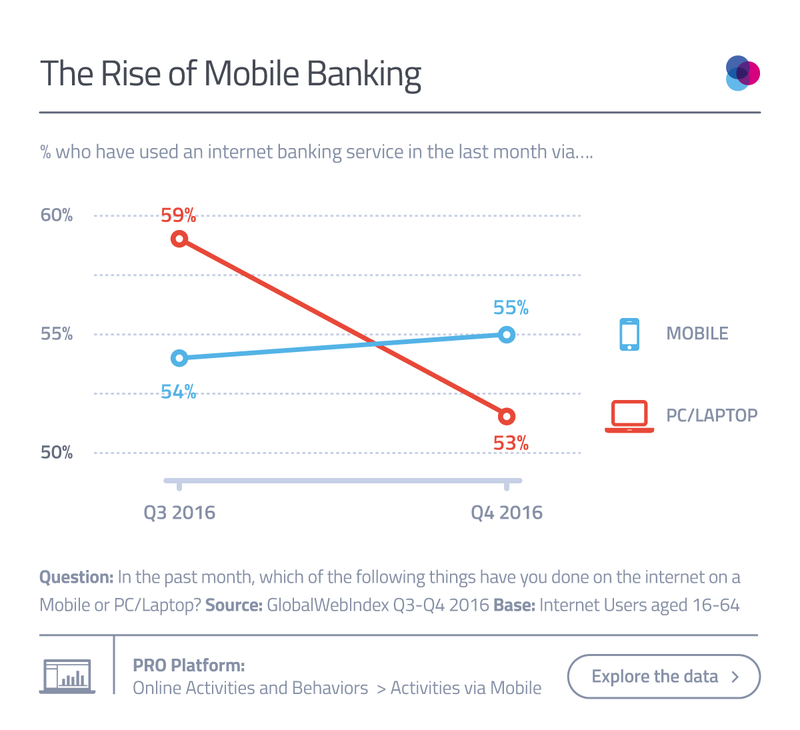 A look at the age breakdown here illustrates the universal appeal of banking online, and particularly the increasing influence of mobile. The continuing legacy of PCs/laptops among older users is clear to see, with banking via these more “traditional” devices seeing a higher uptake among older age groups. And if we turn our attention over to banking via mobile, then we see the opposite trend in effect, with 25-34 year-olds having a 29-point lead over the oldest age group (55-64s). While these converging trends may seem somewhat predictable, what they do tell us is that this new and â€˜mobile’ way of handling our financial affairs online has expanded the appeal of online banking among the largest cohort of the global online population: Millennials. 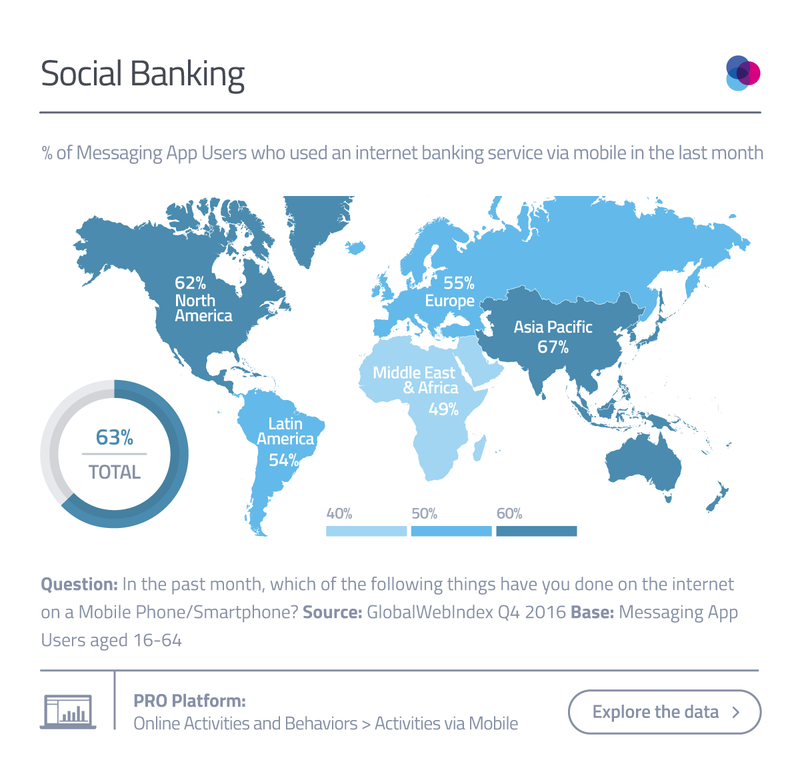 Social messaging apps are primed to make a substantial impact in the fintech arena. There’s no shortage of examples to choose from of social integrations with online banking. 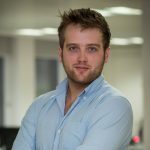 Most recent is the example of TransferWise who have teamed up with Facebook Messenger to allow users to send money internationally via chat bots. Beyond its extensive reach, social media is having an increasing role in the day-to-day activities of internet users. With each year that passes, our data shows a steady rises in daily time spent on social platforms – now standing at more than two hours per day. This means almost one third of daily time spent online is devoted to social media, and underpinning this is mobile. Social engagement has firmly been a mobile-first activity for some time now, so this rise in time spent on social has been consistent with a rise in time spent online on mobile. Put this in the context of the many messaging apps pivoting towards service platforms rather than outright chat apps and banking integrations with social make complete sense. A look to Asia reveals consumers here are comfortable ordering cabs, booking restaurants and appointments and making payments or transfers through their favorite chat apps. Indeed, many apps that are popular in North America and Europe are learning from these examples, with Snapchat and Facebook Messenger already facilitating money transfers in the US (and soon Europe for Messenger). But with Europe’s upcoming PSD2 set to level the playing field between traditional banks and third-party incumbents, this is already turning heads towards the social space as the next innovation ground in banking. For traditional banks, responding to this changing competitive landscape will mean meeting the consumers where they are, and this is where social comes into play. Other factors are also at work here, such as broader omnichannel strategies to integrate multiple channels of communication and provide a seamless consumer experience – which is by no means reserved for retail shopping. Getting this seamless cross-channel experience is something consumers increasingly expect – 26% of mobile banking users, for example, expect a brand to provide services and products that help to simplify daily life, while 16% want brands to offer a range of useful apps and online services. It’s in providing this seamless customer experience that the answer essentially lies – as banking gets more mobile, so too does it need to meet consumer expectations heightened by the convenience that smartphones bring to every other aspect of our lives.